You’II Never BeIieve This!!! Watch it bf they make us take it down! **Note – Scams like this often use multiple domains, so you may see a variation in the landing pages and scam messages. If you did make the mistake of sharing the scam link, then you are now spamming your friends with the very same message. Clean-up your newsfeed and profile to remove references to the scam. (click the “x” in the top right hand corner of the post). 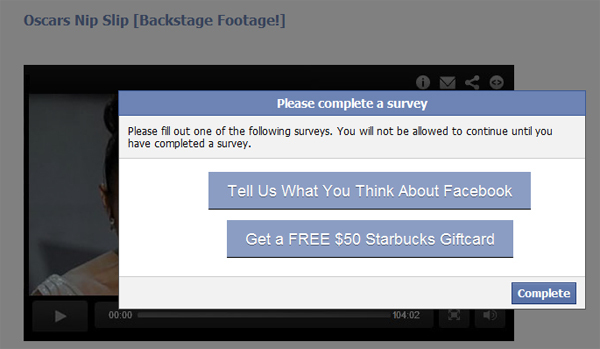 Never complete surveys to unlock videos or other content on Facebook. Scammers use these tricks to either spread malware, obtain personal identification or earn commissions from marketing companies. Don’t pad their pocket and possibly open yourself up to harm! Some of the surveys require you to download files to your computer. Never do this! If you did so in error, then run a complete system scan with a good anti-virus software program. The I.Q. Quiz scam has been around for a while, and it typically requires you to enter your cell phone number to receive the results. The scammers then bill you for premium services. Keep an eye on your phone bill for bogus charges. BitDefender Safego is a Facebook application you can install that will scan your News Feed and help keep you safe from scams like this. Roboform is a 5 Star, award winning password manager. Reduce all passwords to just one, and automatically login to websites.